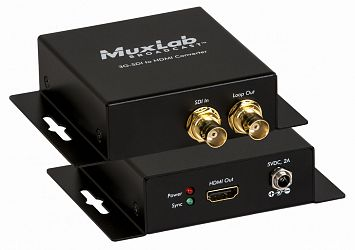 Muxlab 500717 är en omvandlare som tar emot en 3G-SDI signal och lämnar ut en HDMI signal. The 3G-SDI to HDMI Converter (500717) allows SDI equipment to be connected to an HDMI Display. The 3G-SDI to HDMI Converter converts the SDI signal back to HDMI, supporting resolutions of 480i (SD-SDI), 720p/1080i (HD-SDI) and 1080p (3G-SDI). The 3G-SDI to HDMI Converter provides a low jitter and re-clocked outputs allowing for unit daisy chain.